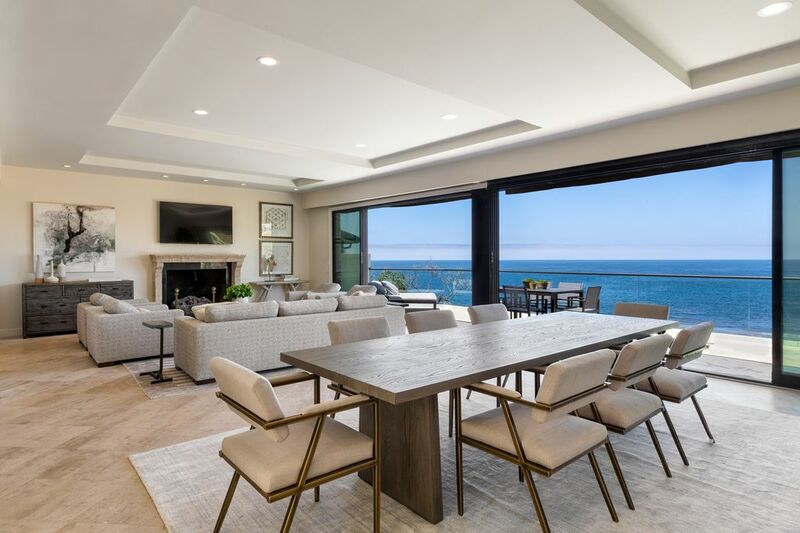 Located in North Laguna, enjoy dramatic views of the coastline and of Catalina Island has just completed renovation August of 2018. Pass an English cutting garden to a stunning entry hall leading to a spacious living room that spills onto the cliff-top terrace.The gourmet kitchen opens into the family room.. SONOS wireless High Fi throughout. Play music from your smartphone, tablet or computer. there is 65' flatscreen in the Living room. Listen to the ocean from the master suite that opens onto the terrace. It has a large bathroom with 2 sinks and a large walk-in closet. There are 3 guest rooms. One with a queen bed with an en suite full bathroom. The second guest room has a king bed and shares a full bathroom with the third guest room which has King bed. Located minutes from downtown Laguna Beach to the south and upscale Newport Coast to the north. Weekly maid service, weekly gardener service. This home is very special and on the 4th of July the barge for the incredible fireworks show is right in front of the house. SONOS wireless High Fi throughout. Play music from your smartphone, tablet or computer. Thank you to Susan and Kirk...everything was perfect. Your home is gorgeous with a view that cannot be captured in a photo.....a spectacular panorama of the coastline and sunsets that don't look real. We decided to stay in house for our dinners so that we could have the pleasure of the view in the evenings. Susan referred us to a fabulous caterer (Jeanine Megonigal) who prepared our meals and had it delivered right on schedule each evening. All we had to do was heat it up or bbq and serve .... food was excellent...there isn't a restaurant in town that can match this total experience! We enjoyed days out at the various beaches (all walkable) and spent time in the town. Laguna is a fun and vibrant city. This home is a slice of paradise. Thank you again Susan and Kirk . We have rented this lovely home twice now. Once in April of 2016 and then again in November of 2017. If I could have one wish to spend the rest of my days, it would be here. The place is neat, clean, has all of the amenities anyone could ever need and is an absolutely gorgeous and safe location. The owners of the home are wonderful to work with. They are very responsive and do everything to make your visit just right. They even include little touches and you can tell they have your best interest at heart. The weather was absolutely perfect with each visit. As it is most of the time in Laguna Beach. I can't stress enough how accommodating the family that owns this home is. We had a tiny issue with some construction going on in the area and they took care of it RIGHT AWAY. A non issue really. But I was impressed at how responsive they were. We took our daughter, her fiance, our niece and another 4 people and still had friends over. The home didn't feel crowded or cramped one time. There are plenty of living spaces to enjoy. I don't know what I'll do if I can't go back this year. I feel honored to be able to stay in such a lovely home. Our family stayed in this house in mid December 2015 and had a great time. The house is properly represented with a beautiful view of the Pacific Ocean from the living room and master bedroom. They are about 1 mile north of Laguna downtown which was easily accessible. The area is a very quiet and upscale neighborhood. Susan who manages the house is very attentive to every detail and made us feel very welcome. The house is well appointed and kitchen well equipped for cooking. My family and I stayed here for a Labor Day getaway close to home. We come from the neighboring town of Aliso Viejo. I have to say, this was the best idea I've ever had! We were 4 adults and 3 kids (ages 2, 10 and 12). The house had everything we could ever need. We spent our days at the nearby beach using the chairs, umbrellas, towels and sand toys that were supplied. And every afternoon and evening we spent on the balcony, listening to music and watching the ocean. Such an amazing view! I would have been happy to never leave the balcony our entire week. We ate every meal at the house because the kitchen was great and no restaurant has a better atmosphere than that terrace! We all really felt like we were on a big vacation but we only had to drive 15 minutes to get there. Awesome! Will definitely be returning someday. Thanks, Kirk and Susan. We almost feel like part of the family after working with you. See you next year! We spent at this house 2 weeks with our 3 children and their husband/spouse. The weather was best ever, the house views absolutely outstanding, the beach 5 min walking. A complete supermarket at 3 min by car. The best of Laguna at walking distance. Thanks so.much Kirk and Susan for this fantastic days and for your marvelous house!